China Glaze OMG collection holos need no introduction because they are just AWESOME in my book. 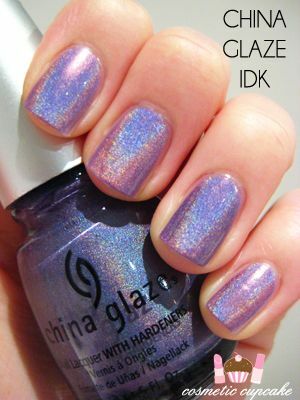 IDK is a dusty purple holo and was one of my 1st China Glaze polishes when I was just getting obsessed with nail polish. I had no idea what "holo" even was but I knew I loved this polish! Still do as a matter of fact. Below is 2 smooth coats with no topcoat. Close up pic of holo-y goodness! Bit blurry oops. I'm so glad this week is over! I'll be back with longer posts soon hopefully. Thanks for looking as always! Holos are great when life is crazy. They make you stop and stare at them. Hope your feeling better. I love it! I am so buying this whenever I finish my Project 10 Pan! I love this purple holo! I don't own any of the OMG collection, this is so pretty!! @Chris: I totally agree. I couldn't stop staring at my nails and I did feel so much better thanks! @Jennifer: Thanks Jennifer! IDK is an awesome holo. @AnnKiins: Hope you cross it off your wishlist soon! It's a must have polish. @Savannah: Definitely get it! The photo doesn't do it justice - it's just beautiful in real life! @Katrina: What are you doing?? GO AND GET SOME NOW! You will not regret it, they are all gorgeous! @Sarah B: I agree! LOL is nice but IDK is definitely prettier. 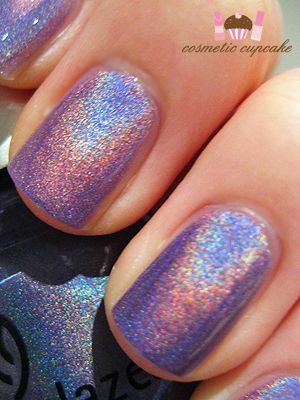 @Freshie: This is my favourite from the collection, purple + holo = LOVE! @Steph: It's even prettier in real life. You should see it shimmer in the sun! Unfortunately I didn't get any pics of it during the day though. Yayyyy, you did a holo mani in the end! @Dhini: It's very pretty isn't it? Thank you I'm feeling much better now! @Oreleona: I love China Glaze too! The majority of my collection is make up of their polishes hehe. OMG <3 need to hunt this baby down!!! Gorgeous!!! @Jadegrrrl: You need to pronto!!! All the polishes from this collection are stunning!